With many biopics, the task of the filmmaker can be a difficult one, capturing the often larger than life exploits of the subject and condensing it down for the viewing audience. Such was the case with Bohemian Rhapsody, a film that tracks the rise to fame for legendary Rock and Roll Hall of Fame act, Queen, but primarily centers on the difficult life led by frontman Freddie Mercury. Rami Malek, best know for his TV work in Mr. Robot, was the eventual choice to portray Mercury, with it seemingly being a solid choice given his physical similarities to the singer. However, Malek embodies the role of Mercury fully and has rightfully received raves for his performance as the singer, adapting the stage mannerisms and his bold confidence and strident belief in himself as an entertainer along with bringing a vulnerability to coming to terms with who he was as an individual. Though much of the cast is relatively unknown, the performances are solid. 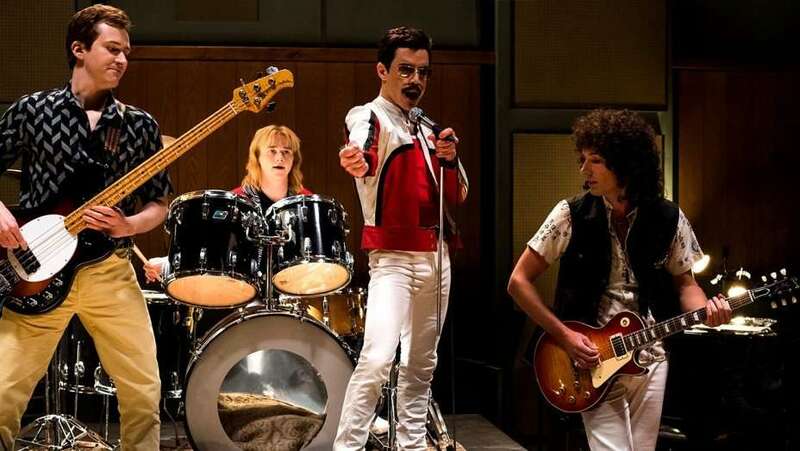 Gwilym Lee and Ben Hardy both look the part, but bring relatable and likable traits to their roles as Brian May and Roger Taylor, while Joe Mazzello is solid, albeit with less screen time, as John Deacon. Lucy Boynton, who turned heads in Sing Street, delivers a heartbreaking turn as Freddie’s wife and first love Mary Austin. Mercury, aka Farrokh Bulsara, is introduced as an outcast teen whose family fled Zanzibar, looking for a life better than what his family had in mind and having a clear vision that music is his path. In the film, Mercury happens upon the band Smile, which featured Brian May and Roger Taylor, who had just lost their vocalist who decided he had to move on to bigger things. Mercury also meets and falls for Mary Austin (Lucy Boynton), starting a sweet and loving relationship as the band starts to take shape. If there is an issue with Bohemian Rhapsody, it could be the pacing of the film. But as stated, there is so much of Queen’s history to tell, that some key moments are bound to get a bit glossed over along the way. What is developed though is the key relationships in the film, with Mercury sometimes challenging his bandmates but holding steadfast to the idea that they were family, and the singer also believing that Mary was his one true love, while coming to terms with his sexuality while out on the road. The relationship with Mary is sweet, but ultimately heartbreaking, as Mercury seems at odds with accepting how life was playing out as Mary found the strength to let go amidst Mercury’s desire to keep their life status quo. While some have been critical about how Mercury’s sexuality was revealed in the film, it’s not exactly shied away from. His dalliances with male suitors, in particular Queen staffer Paul Prenter (Allen Leech) and his eventual late life love Jim Hutton (Aaron McCusker), are both addressed, even though stopping short of the bedroom (likely due to the PG-13 film rating). As for the band side, Mercury is viewed as occasionally difficult to work with, suffering a bit of lead singer’s disease, but the genuine musical respect and vision is showcased through the film, with the group as a whole staying true to the challenges of their music despite the occasional critical reviews or interference from corporate suits. Tensions do mount amidst the band, but never beyond repair, and the group bond is really at the heart of the film. Through it all, Mercury may seem on top of the world from the public eye, but he spends a lot of the movie ultimately figuring out who he is in this world. Final act revelations allow him to work through some of his personal flaws, accepting the love of others as learning to love life as himself while ridding himself of negative influences. Where Bohemian Rhapsody does thrive is with its musical scenes, serving as a bit of a jukebox to the group’s mastery. If you’re a fan of Queen’s music, you will likely be satisfied and even love this film, as they do hit on a number of the band’s biggest songs. The recreation of their goose bump-inducing Live Aid performance also is worth the price of admission, while also serving as a key payoff for the film’s final act. In summation, Bohemian Rhapsody does a solid job of telling Freddie’s story, even if it does take a few liberties with the timeline and certain events. Viewers get a fair representation of a talented singer, a somewhat flawed man and an incredible salute to the music the group created.